RHB helped Agnes Scott recruit the strongest, largest and most diverse class in the institution’s history. When we began working with Agnes Scott College (ASC) at the height of the recession, colleges in general and women’s colleges in particular were struggling. Most small, single-gender liberal arts institutions were worried about mere survival, but ASC wanted more. They wanted to thrive. They were determined to grow enrollment while recruiting and shaping a more diverse incoming class—geographically, economically and culturally. And they were committed to being true to their mission, attracting students who would succeed in their academically rigorous environment and finding a marketing partner who valued openness, flexibility and honesty. RHB was a good fit. Our engagement began with Circles of Influence, which allowed us to hear from students, faculty and staff about what makes Agnes Scott an amazing place. In their own words students told us about the sisterhood and strength fostered by the College, how their community emboldened them to become agents of change and how much they expected from themselves and from each other. They saw themselves as leaders who wanted to engage the world in a meaningful way, which is how the president of the College, Dr. Elizabeth Kiss, saw them as well. Based on the insights we collected in Circles, RHB developed a 36-month recruitment communication strategy that interacted with prospective students from their sophomore-through-senior years of high school. 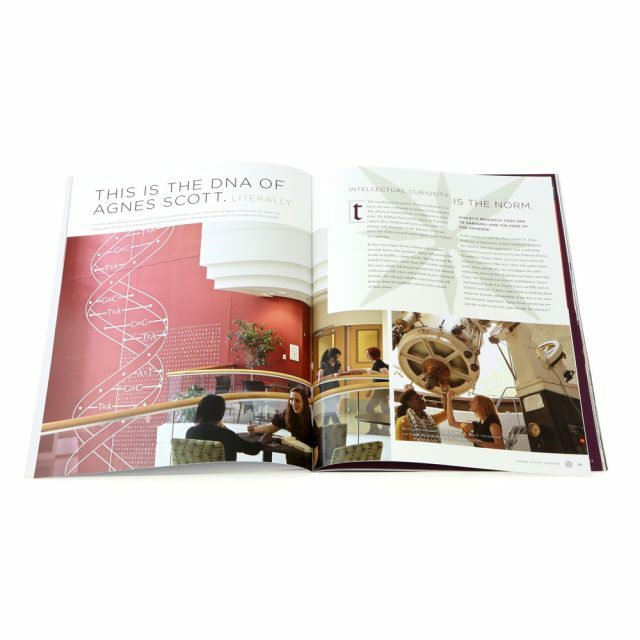 At the center of the campaign was a beautifully designed viewbook that emphasized the quality of an Agnes Scott education in theme, content and craftsmanship. An accompanying yield campaign invited students to see themselves at Agnes by way of a scented experience booklet that featured evocative fragrances from around campus and gifted them with a perfumed hand lotion made by an apothecary alumna. Additionally, a social media component invited students to interact with one another at points throughout the recruitment cycle. This award-winning campaign was featured on NPR and in The Wall Street Journal. It also led Agnes Scott College to an 8% increase in yield, gains in average family income and a substantially more diverse incoming class. As the College evolved, so too did our relationship. Based on our research, President Elizabeth Kiss’s vision and a College-wide commitment to providing students with the most relevant and exceptional education possible, ASC made the bold decision to implement a new curriculum dedicated to global citizenship and thoughtful leadership. We were invited to consult on the development, naming and branding of this initiative, which is now known as Summit. To reflect the maturity of the experience at Agnes Scott, it was necessary to revisit and revise the recruitment campaign. 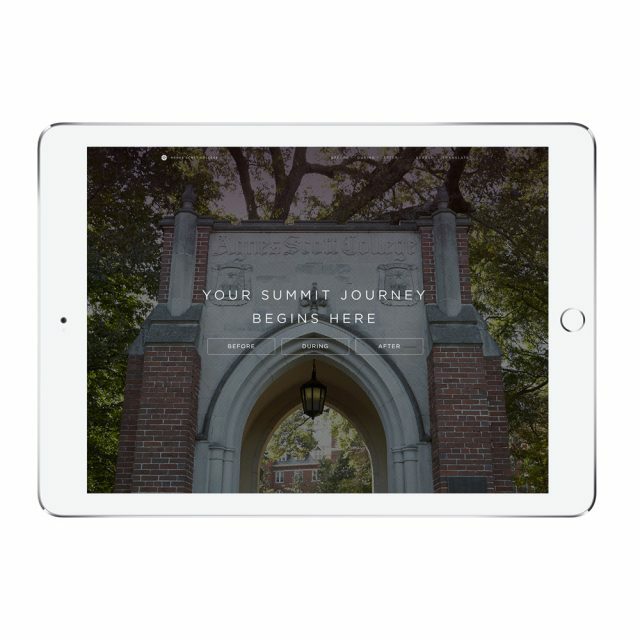 We updated the viewbook to include Summit and created a suite of materials that communicated the new opportunities now available at the College to future students. At the center of this work was a beautiful new microsite that clearly and compellingly highlighted the benefits of the new curriculum while allowing us to make updates to the content in real-time. And, in a nod to the previous campaign cycle, we imbued everything we created—from financial aid letters to Summit brochures to acceptance notices—with the fragrance of Agnes Scott’s signature scent, Black Onyx, which is named for the stone at the center of all Scottie class rings. 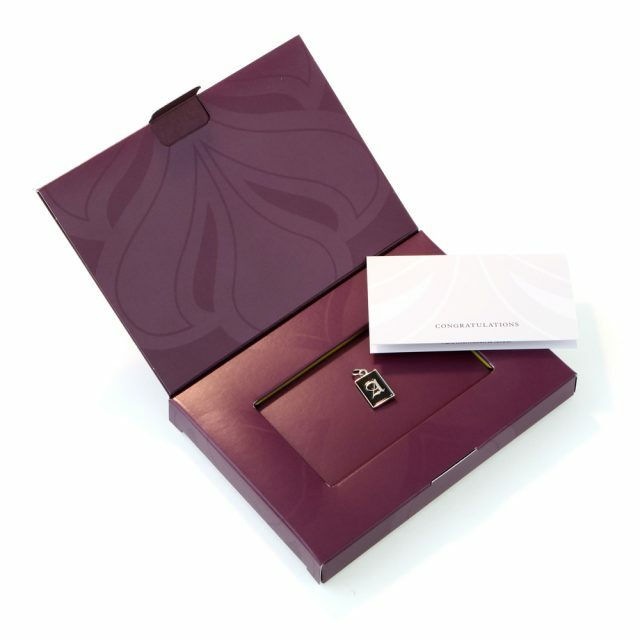 This fragrance is also filtered through the air in the ASC admissions office and was made into a solid perfume that was given as a yield gift, creating a truly evocative, multi-sensory experience, from start to finish, for all future Scotties. Last year, Agnes Scott recruited the most diverse class in its history. This year, they recruited their largest. And next year’s class, as of May 2, is already on track to break that record.